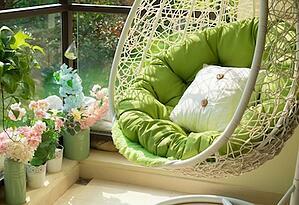 When it comes to decorating, is your balcony or patio an afterthought? With summer’s nice weather, use these tips to make the outdoor area of your Springs luxury apartment home a comfortable and inviting place you won't want to leave. Your mind is probably thinking along the lines of furniture and plants, but adding attractive flooring is one of the quickest ways to eliminate a generic look. Indoor/outdoor rugs come in an incredible range of colors, styles and sizes, or get the appearance of a "deck" with interlocking outdoor tiles. Every inch of real estate on a patio or balcony is precious. Think outside the box for decorating options that help you make the most of them. Crates are a classic option for DIY furniture. They make great side tables that come with built-in storage space. Bench seating is another way to maximize space. Not in the budget? Save money and boost your green karma with a DIY bench using materials such as pallets, cinder blocks and 2x4s. A simple tiered shelving unit can be used to hold plants or baskets for pillows, light throw blankets and other accessories. Why not enjoy your patio or balcony any time of the day? A bistro table and chair set lets you linger over that last cup of coffee in the morning or savor that first sip of wine in the evening. Lighting might be something else you don't think about, but a soft glow creates a cozy, relaxing ambiance. You can set the mood with string lights are perfect, or line the balcony railing with tealight holders. Flowering or green plants are a natural complement to a patio or balcony. Stagger the heights of containers to add visual interest. For some truly unique containers, use decorative tins from coffee and tea, peanuts and other food items. Vertical plant displays are visually pleasing and space-saving. Wooden pallets are amazingly versatile when it comes to making vertical planters. Do you enjoy cooking with fresh produce and herbs? You can actually grow these items in containers. Get some ideas from these practical yet whimsical patio and balcony accessories. Catch up on work or check your social media accounts with a balcony desk and flower box. If you're keeping your outdoor area as a no-work zone, the surface makes a handy tray for food and drinks. Railing planters give the effect of a genuine garden without taking up too much space. Don't let corners go to waste. Add a shelving unit or make your own floating shelves. What's your favorite patio or balcony decorating tip? Share it with us in the comments!